[Feature Request] Import Verified URLs Automatically from specified file — . :: GSA SEO & Marketing Forum ::. This will be a wonderful feature. Ability to Import Verified URLs Automatically from a specified file every X minutes. (only append new urls) This will save us a ton of manual work and it's a great addition for those who have Virtual Assistants or tools that export tier1 links to a specified file automatically. So it will feed GSA SER on auto pilot. well why don'T you let the tool export to the file <project name>.new_targets ? That will let SER import the URLs directly. @Sven I guess you didn't get what I need. 1- Save us long hours of manual import for tier 1 links built with other tools. Can you imagine the time needed to manually import verified urls in 160 projects on 5 different servers? That's 800 projects that need manual import!! A huge pain in the neck. 2- Ser will be a flying Tier2 auto pilot tool for those who use other tier 1 tools with automatic export feature. Just set it once and forget it! Any chance to add this feature please ? 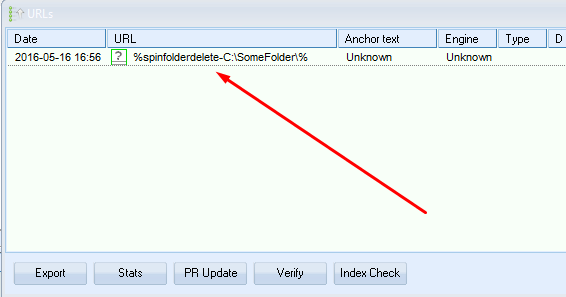 or maybe just make the %spinfolderdelete-C:\SomeFolder\% active in verified url window ? is that possible please ? no, that will not work...I will try adding this differently. added for next update in "External APIs" tabs.